The Gowanus Lounge: Warnings Before Roof Collapse on First Place in Carroll Gardens? 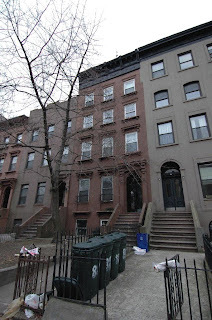 Warnings Before Roof Collapse on First Place in Carroll Gardens? Were there warnings before the roof collapse at that building at 90 First Place in Carroll Gardens on Sunday night? Brownstoner has details on the collapse and the Department of Buildings response, including a Stop Work Order. A look at the DOB website, finds 6 complaints lodged against the building since May, including ones for large pieces of falling debris, an illegal fence, debris being tossed from windows and construction exceeding the approved permit (exterior work being done when the permit only covered interior work). Three of the complaints, however, relate to the roof collapse itself. The roof of a building under construction at 90 First Place collapsed last night. The fire, police and building departments were on site assessing the situation. There is currently a stop work order posted on site. The elected officials were notified. This is the building that has a construction shed that goes completely to the sidewalk, and that sometimes has a truck collecting debris in the courtyard. (Parking in the courtyards is illegal under the City Transportation Code). I was told by tenants of the adjacent buildings that the roof had been sagging for some time, and that 311 had been notified by several of the nearby tenants and property owners. Some of the nearby neighbors surmise that the rain on Saturday probably may have facilitated the collapse. This building had been completely gutted and the walls had just been stabilized with supporting beams, but a neighbor who has a view of the building said that many of the beams seemed to have been knocked down by the weight of the roof debris. Neighbors told me that they have reported other construction site problems to the building's department and 311. There's no record of "sagging roof" complaints on the DOB website, which is interesting. I live on the block (as you might have guessed). I could figure out why they were leaving the roof on through the reno. The one on 3rd place scrapped the roof along with all the guts; seemed like the better way to go. I get the feeling these are not the most accomplished contractors over there. When they removed the rear fire escape, they let the entire thing crash into the backyard in one piece. Not bright. All that said, I hope they are able to preserve the facade of the building. From some angles, it looks a bit crooked. And of course, coming home to find a block full of fire trucks and emergency vehicles, I was relieved to see my house was not afire, and no one was hurt. Just another example of "construction as usual" in Carroll Gardens, and "business as usual" at the DOB. Too many construction permits issued, too little oversight in the field, too few capable (and honest) contractors, architects and developers, and too many DOB persons doing nothing (or worse) downtown. Is it any wonder CG residents have called for an immediate building moratorium?